This painting of what is now the Abel Tasman National Park coastline won first prize for landscape painting in watercolours at the New Zealand Industrial Exhibition in Wellington in 1885, and then won a commemorative medal at the Colonial and Indian Exhibition in London the following year. 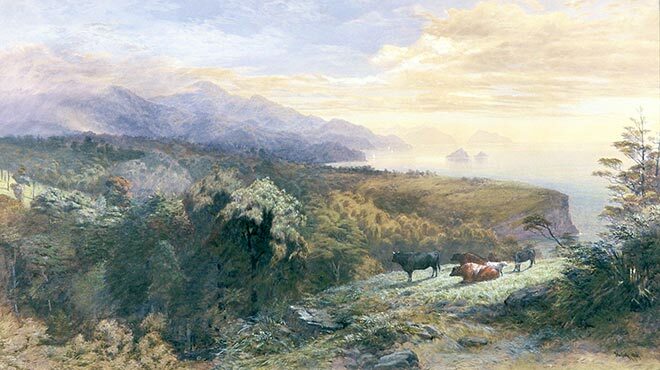 Such paintings were shown in great numbers at most international exhibitions to present New Zealand as a beautiful and romantic destination for both tourists and immigrants. The cows, rather oddly placed in the foreground on a small patch of grass amid the bush, suggested that pastoral pursuits existed alongside wild sublime beauty. The painting was subsequently purchased by public subscription as the first painting for a public art collection in Nelson.